Sometimes I need to run X Windows-based applications inside Docker containers, and running the server locally is too unpractical because of latency reasons or the working laptop has no X Windows Server. First I tried to create a VirtualBox-based Vnc Server, and it worked fine albeit a little slow, but Docker containers seem to have better memory and disk footprint. So I tried to create Vnc Server running X Windows inside a Docker container. I already tried suchja/x11server (ref) but it has strange problems ignoring cursor keys of my MacBook on webkit page (such as Pentaho Data Integration's Formula page). After that, run vncserver :[display-number] with a user-specified password. The problem is the vncserver fails looking for some 'default' fonts. vncserver0 | Couldn't start Xtightvnc; trying default font path. vncserver0 | Please set correct fontPath in the vncserver script. vncserver0 | Couldn't start Xtightvnc process. vncserver0 | 30/10/16 09:20:28 All Rights Reserved. Please select the layout matching the keyboard for this machine. Now to view the screen, you could connect to the VNC server by using VNC Viewer or opening vnc://localhost:5903 url in Safari. We are able to run X Window Server running inside a Docker container. The resulting images are about 625 MB, which could be a lot smaller if we remove firefox (iceweasel) and use only Openbox Window Manager. This post would describe notes that results from my initial exploration using docker. Docker could be described as a thin VM. Essentially docker runs processes in a linux host in a semi-isolated environment. It was a brilliant technical accomplishment that exploits several characteristic of running applications in a linux-based OS. First, that the result of package installation is the distribution of package files in certain directories, and changes to certain files. Second, that executable file from one Linux distribution could be run in another Linux distribution provided that all the required shared library and configuration files are in their places. 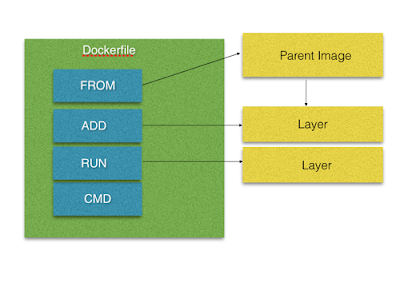 Docker images are essentially similar to zip archives, organized as layer over layers. Each additional layer provide new file or changed files. Docker image should be portable, means it could be used in different instances of application in different hosts. a. Dockerfile essentially shows the steps to install the application packages or files. After executing each RUN command in the Dockerfile, Docker creates a layer that stores the files add or updated by the RUN command. 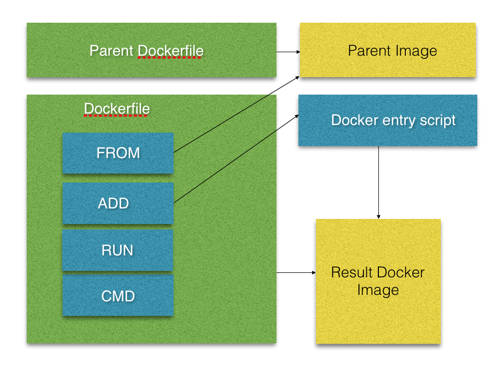 b. Docker entry script shows what command will be executed if the image is being run. This could be a line running existing program, but it could also point to shell script provided. ADD : add a file to the docker image filesystem, if the file is tar then Docker would extract it first, and it were allowed to use file from local filesystem or an URL from the internet. There are a few basic docker commands that you need to know when using docker. docker ps : print running processes (containers in docker lingo). The variant is docker ps -a , shows running and terminated containers. docker inspect : show various information of a running docker container. Join with grep to get shorter output, like : docker inspect | grep 172 -> this will filter to show IP addresses. Container could be referred by its name or id. docker history : shows the layers composing the image, also shows no-operation layers such as MAINTAINER. docker exec -it bash : runs a bash shell inside a container interactively. This functions mostly like ssh without needing ssh daemon running inside the container. -v hostdir:containerdir -> mounts a host directory inside the container, this could also works for single file. Specifying no tag in the command implies retrieving mariadb:latest. Docker-compose uses docker-compose.yml as the blueprint of the containers. The volumes clause specifies volumes that are mounted inside the container, like the -v parameter. Specifying a directory in the volume line before the colon (:) means a directory from the host. Specifying a simple name instead will be interpreted as Docker data volume, which would be created if it doesn't exist yet. The directory after the colon shows the target mount directory inside the container. The image clause specified the base image of the container. Alternatively, a dockerfile clause could be specified instead of image clause. The environment clause shows additional environment variables that would be set inside the container. External_links clause refers to name of existing running container that will be referred in /etc/hosts of the container. This example shows two containers with some dependency links. The first, ismsdash-webserver, links to the second container using links clause. The second, ismsdash-php-fpm refers to two existing containers outside this docker-compose.yml file. The first container is created from a docker image. The second container requires the image to be built first using a specified Dockerfile. The ports clause specifies port forwarding from the host port to the container port. Knowledge of several basic commands are neccessary in order to use docker. This post described some commands, hoping that the reader will be able to start using docker using these commands. Docker is fast-growing trend that I could no longer ignore, so I tried Docker running in a Linux server machine. 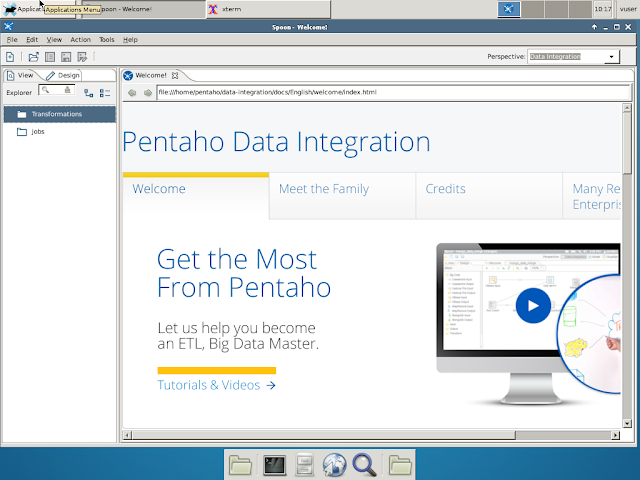 Running server app is a breeze inside docker, but I need to run Pentaho Data Integration in the server, which uses X11 display. There is several references about forwarding X11 connection to a Docker container but none works for my setup, which has Quartz XServer running in Mac OS X laptop and Docker service running in a remote Linux Server. We have DISPLAY set to something like localhost:10.0, and empty /tmp/.X11-unix directory. The reason is that forwarding thru ssh will result in TCP-based X11 service, and it is the opposite of unix socket based X11 service. Inside the container, we are also unable to connect the localhost:10.0, because in the container the localhost would refer to the container's loopback interface, which is different from the host's loopback. For X11 display connections, the 10.0 means TCP port 6000+10, which as the result of X11 forwarding only listens on 127.0.0.1 address. It seems that because different IP being used, the Xauthority file need a row with 172.17.0.1:10 as the key. Caveat : for the formula editor to work in Spoon UI, we need to install firefox and libraries bridging firefox and swt, which is a topic for another post. We have found out how to run X11-based apps from a Docker container with the X Server running in a laptop. What good does this for ? In some cases, we need to run a GUI-based app inside a Docker container, without installing vnc and x server inside the container. However we still have to provide X11 libraries inside the container.